The SanDisk® X600 3D NAND SATA SSD combines Western Digital’s advanced 64-layer 3D NAND technology with a proven SSD platform to deliver the reliability, durability, capacity, and performance required for IoT embedded systems. The SanDisk X600 3D NAND SATA SSD features nCache™ 2.0 and DataGuard™ Client technologies with high-endurance Western Digital™ 3D NAND. This combination enhances endurance and enables seamless recovery from unexpected events. Moreover, using SMART attributes, the SanDisk X600 3D NAND SATA SSD monitors and analyzes its health and alerts the system for any major or maintenance events. The SanDisk X600 3D NAND SATA SSD provides leading-edge performance, with sequential read/write speeds up to 560/530MB/s. This means quick boot-up and application loading, leading to more customers served, reduced downtime and optimized operation. With on-the-fly hardware-based encryption, the SanDisk X600 3D NAND SATA SSD (X600 SED models only) provides complete end-to-end encryption to the storage, system and infrastructure. It supports password protection, AES-256-bit encryption,TCG-OPAL 2.01 standard and PSID. *compared against 512gb capacity during sequential reads. 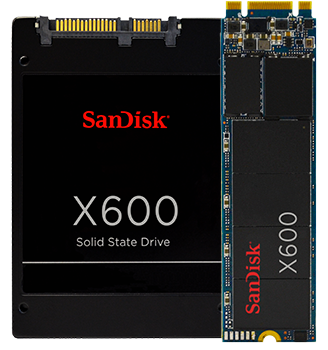 SanDisk X600 SSDs are rigorously validated from NAND to device. Products go through over 500 mixed OEM test suites, stress testing with multiple patterns at the drive level, and endurance testing including RDT and 4-corners lab tests. OEM customers are further supported by a stable roadmap, 2-year availability, consistent supply and fast access to samples. Western Digital has a dedicated support team, design-in tools, application validation, SSD design-in documentation, joint sales support, and an automated integration and validation lab for a quick turn-around time in case of failure analysis. 1 Backwards compatible to SATA 3 Gb/s and SATA 1.5 Gb/s. 2 As used for storage capacity, one megabyte (MB) = one million bytes, one gigabyte (GB) = one billion bytes, and one terabyte (TB) = one trillion bytes. Total accessible capacity varies depending on operating environment. As used for buffer or cache, one megabyte (MB) = 1,048,576 bytes. As used for transfer rate or interface, megabyte per second (MB/s) = one million bytes per second, and gigabit per second (Gb/s) = one billion bits per second. Effective maximum SATA 6 Gb/s transfer rate calculated according to the Serial ATA specification published by the SATA-IO organization as of the date of this specification sheet. Visit www.sata-io.org for details. 3 Measured using CrystalDiskMark, 1000MB LBA range, on Laptop Asus N550J HM86 Express chipset, Windows 8.1 Pro with Intel iRST version 14.8.16.1063, secondary drive with Intel® Core™ i7-4700HQ 2.4GHz, 8GB DDR3 1600MHz RAM. 4 TBW (terabytes written) values calculated using JEDEC client workload (JESD219) and vary by product capacity. 5 Power measurements at 25°C. Based on firmware version with DIPM enabled. Measured using MobileMark® 2014 on Lenovo T560, Intel® Core™ i5-6200U 2.30GHz Processor, DDR3L 4GB 1600MHz RAM, Windows 10 with Intel Driver iRST 14.8.0.1042. 6 MTTF = Mean Time To Failure based on internal testing using Telcordia stress part testing.